It's hard to describe Lakeway Texas Real Estate in a few words...and that's a good thing! If you don't want a cookie cutter neighborhood, if you like lake living, if you want great schools, if you want a community with tons of amenities and three golf courses and close to shopping...then look no further. Lakeway Texas may be the place for you. This is largely due to the fact, unlike many areas around Austin that are new, as a community Lakeway started building up around the 1960s. It started largely with many of the homes being weekend getaways or second homes on Lake Travis. Then through the years building continued so there are homes built in the 1970s, 80s, 90s and now even in 2008 some of the last of the remaining lots are being bought and new homes are still going up. Lakeway is located in Travis County off Highway 620 West of downtown Austin and is easily found by looking for the "giant golf ball", the water tower or Lakeway. The city boundaries of Lakeway actually straddles 620 in that some of the homes on the East side of 620 are in Lakeway and some of the homes on the West side of 620 are also in Lakeway while others on both sides have an Austin mailing address, (or to add to the confusion, Village of the Hills address). I haven't quite figured all that out but for the sake of this description I am describing what most would consider to be the "Original" Lakeway. This is the section of Lakeway that extends from Highway 620 to the West off Lakeway Blvd or Lohmans Crossing. I'll describe communities such as Alta Vista, Preserves of Lakeway, Flintrock separately. What Amenities and Schools like in Lakeway Texas? It's almost easier to say what amenities aren't in Lakeway. Lakeway has parks, golf courses, te nnis courts, even a skateboarding park along with a pool and of course...it all sits on the gorgeous Lake Travis. This means there are golf course homes as well as waterfront homes to be had if you have the money. 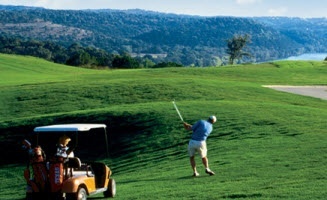 Did I say Lakeway has some golf courses? While Lakeway has three golf courses within its boundaries, it is within minutes of ten golf courses, there are also 8 boat launches, 19 marinas, 15 public parks. As for the schools...Lake Travis ISD is one of the most highly regarded school districts in the Austin area. Lakeway built on Lake Travis "The Jewel of the Highland Lakes" runs forty miles through the hills of Central Texas. It has hundreds of small coves along the shoreline, with some that wonder a mile off the main lake into some secluded, still undeveloped areas...though admittedly these are farther from Austin and harder to come by than a few years ago. What are the homes like in Lakeway? The beauty of Lakeway is that unlike many communities around Austin, the homes in Lakeway can't be summed up in a single style. Because there is no predominant style. What makes this appealing is that the homes are all different...there is no one builder that built up Lakeway, rather it would appear there have been literally hundreds of builders over the years that put their stamp on a home in this community. The styles of homes in Lakeway are as diverse, you can have a brand new Texas Tuscan style home, next to ranch style home built in the 1970s. You can have a huge home with the orange tile roofs and Mediterranean stucco, next to a two story country style home with a wrap around front porch. A hard contempoary style home can be next to a red brick traditional home. I think you get the picture. Somehow it all works. The winding, hilly roads curving around the golf course makes for an interesting drive all the while knowing in the very back there is the payoff...lake travis. There are a few condos, townhomes and garden homes in the Lakeway community but by and large Lakeway is made up of single family stand alone homes. We are often asked about leases of homes in Lakeway and other high end neighborhoods, while most of Lakeway is owner occupied, there are a few leases to be found. If you are interested in a receiving a list of the current leases in Lakeway, please email us at info@adkor.net or call us at 512-449-6070. How much can you expect to pay for Lakeway Real Estate? The price range of the Real Estate in Lakeway is broad for two reasons, 1) There are some gorgeous waterfront homes in Lakeway that run up into the millions 2) There are some small homes built in the 1960s and early 70s that have not been updated, while there is also brand new construction in Lakeway with homes well over 3000 sq ft having all of the most popular features. Looking at active listings and homes that sold in 2008 the average price for a home in Lakeway is rougly $575k. The price of new construction in Lakeway on the other hand averages closer to $800k. The range was from $200k for a small older home, likely not updated, to over $3 million dollars for a waterfront home. Grocery shopping is literally just outside the entrance of Lakeway where Lohmans Crossing hits Highway 620. The Randalls is a great store with most anything you might need. Other incidentals can also be found at that intersection from a drugstore, Starbucks, postal service etc. Down the street another strip center has a wine shop, restaurant, another Starbucks as well as a few more shops. You also have the expected fast food stops such as What-a-Burger, Sonic, Chic Filet etc. But it's the new mall, Hill Country Galleria that just opened up off Highway 71 that really simplifies life in Lakeway. This mall has pretty anything you could want in an upscale mall and it's only about 10-15 minutes away. Call us today at 512-449-6070 or email us at Info@Adkor.net and let us help you with your Austin Real Estate needs. Find out why Adkor Realty is truly…A Different Kind Of Realty! Oh...by the way...I can't leave the subject of Lakeway without mentioning the deer. If you like deer Lakeway has quite a few, you will some them in small herds sometimes skipping across the lawns. There are so many deer in fact that the City of Lakeway has posted many "DO NOT FEED THE DEER" Signs as the deer are somewhat a nuisance and eating the landscaping.